Riddle me this, as we exit World War I week here in Newport. What would Thucydides have made of the Great War had he walked the earth a century ago? The chronicler of the Peloponnesian War pronounced a looming shift of power the truest cause of twenty-seven years of Greek-on-Greek strife, pitting rival alliances against each other. The rise of Athenian power kindled fear in a Sparta jealous of its supremacy. War ensued. What could be simpler? “Power transition” is political-science jargon for Thucydides’ idea that ambitious new challengers unnerve established powers. When a rising power starts overtaking the reigning hegemon by economic and military measures, and thence converting physical into political power, the hegemon is tempted to answer the challenge by force — restoring its paramount status. Such forebodings bring on bloody, oftentimes protracted strife as each contender takes up arms in its cause. Thucydides implies, without quite stating a general rule, that stagnant or declining hegemons inevitably march off to war against powerful upstarts. If that’s true, the rhythm of rise-and-fall is destiny. But the convoluted origins and conduct of the Great War defy such straight-line analyses. Think about it. 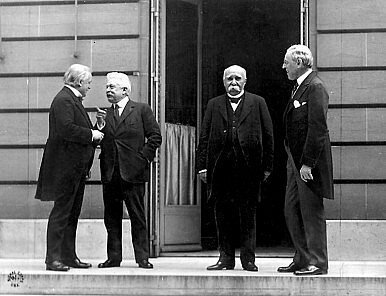 The fin de siècle years saw not one but three ambitious powers — Imperial Germany, Imperial Japan, and the United States — burst onto the scene. Yet Britain fought only one of these rivals, Germany. And it did so with overt help from a second, America, and the acquiescence of the third, Japan. Wherever he is, Thucydides’ head must be exploding. Take that, father of history!!! Prescience, it seems, eludes the greats as well as us lesser beings. Why did events depart from the Thucydidean pattern a century ago? You can never go wrong flipping open an atlas to get started. Two of the three potential challengers, Japan and America, lie far away from the British Isles. Geographic distance attenuates international competition just as it attenuates electromagnetic radiation. It’s just not easy to radiate force against a rival situated thousands of miles away. Germany, by contrast, lay just across the North Sea — in easy striking distance of the British homeland. Proximity, then, matters. Next, a threat is a product of physical capability and hostile intent. All three powers-on-the-make were constructing formidable fleets, the instrument whereby states separated by water projected force against one another. Each navy boasted the potential to make itself number one in its home region vis-à-vis a Royal Navy that was stretched thin defending the empire on which the sun never set. If London chose, it could reassert its maritime dominance in the Americas or the Far East — but only at the expense of leaving other theaters uncovered. A strategic dilemma, to be sure. But from the standpoint of intentions, neither Japan nor the United States appeared that troublesome. Japan had allied itself with Britain in 1902. The United States and Britain had gotten used to each other as the 19th century progressed, putting the late unpleasantness of 1776-1783 and 1812-1815 behind them. They struck up a bargain around the turn of the century whereby the Royal Navy went home and Washington pledged to mind British interests in the Western Hemisphere. Transatlantic relations appeared mostly tranquil. Which left Germany. Germany was close by, it boasted naval capability galore, and its intentions were indecipherable under the Kaiser. To guard against threats, you can plan against capabilities or intentions. If the opponent’s behavior is utterly erratic, like the Kaiser’s, you have to plan against his capabilities. Hence the Anglo-German naval arms race that helped precipitate the Great War. So the antebellum years saw one rising power join the established global power to thrash another rising power. Now, to be sure, the United States under Woodrow Wilson did hope to curb British maritime supremacy, considering it the seaborne counterpart to German militarism on land. But Wilson believed he could bring this about by shaping the postwar settlement rather than taking up arms against the Royal Navy. So it seems power transitions can take many forms, and they may not involve armed conflict. Thucydides, call your office. Why the U.S. and China aren’t necessarily Athens and Sparta or Britain and Germany before WWI.